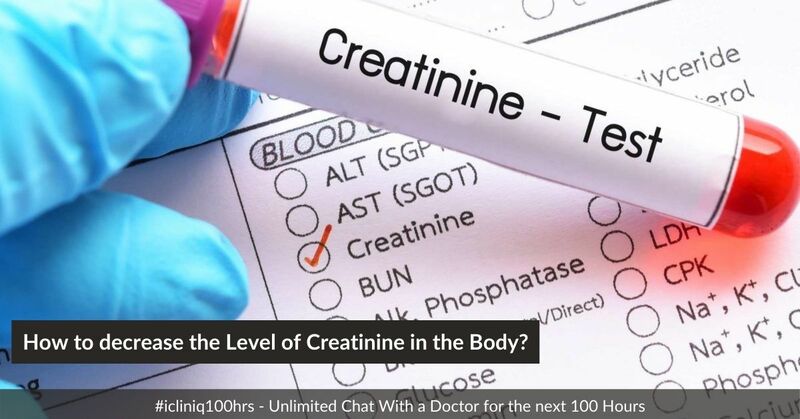 iCliniq › Ask a doctor online › Health Articles › Normal Serum Creatinine Level › How to decrease the Level of Creatinine in Body? • What Are the Treatments Options to Lower the Creatinine? Serum or blood creatinine gives an idea about renal health. Creatine phosphate is made with three different types of amino acids such as arginine, glycine and methionine. It is useful to provide energy supply to muscles. Creatinine is an end product of this creatine phosphate molecule. It is a type of waste product that is released in the blood due to exercising of the skeletal muscles. It is actually produced from creatine. Each and every day, some amount of creatine is transferred into creatinine. Its value is approximately 2 % every day. Creatinine is a very harmful product for our body and that is why its elimination from the body is necessary. Blood creatine is transported to kidney and kidney excretes this product through urine from our body. That is why kidneys play an important role in the filtration of the blood. Concentration of the creatinine is important in the diagnosis of various kidney related disorders. It provides an idea about the normal function of kidneys. If kidney function is impaired, there will be an alteration in the amount of creatinine from the normal value. If kidney fails to eliminate creatinine, concentration of the creatinine will be high and sometimes cause kidney failure. So, it is a wise decision to take blood and urine test prior to giving treatment for any disease. Sometimes, the patient is asymptomatic with high creatine concentration. Normal value of creatinine is measured in milligrams (one thousand part of the gram) per dl of the blood (one tenth part of one litre). In male - 0.6 to 1.1 milligrams per dl of blood. In female - 0.5 to 1.1 milligrams per dl of blood. Infant - 0.2 milligram per dl of blood or above (due to less muscle mass). Person with one kidney - 1.8 to 1.9 milligram per dl of the blood. Creatinine level 2.7 with controlled BP. Kindly advise the food to be taken. My dad has been advised temporary dialysis. Does he really require it? Is there any treatment for reducing creatinine level? Creatine is formed in the liver. After formation, it is transported to various organs or muscles or brain. After reaching to a particular site, it reacts with phosphate and makes phosphocreatine. During any activity, this creatine and phosphocreatine is broken down by creatine kinase enzyme. This also converts all compounds into creatinine and releases into our body. There is always some alteration in the value there. Young and muscular adult men have high concentration of creatinine than older ones. Sometimes, malnourished or under nourished persons, amputation (removal of one or more extremities), less muscle mass, severe weight loss may have less concentration of the creatine in the blood. There are some cases related to high creatinine level in blood. They are disorders of kidneys, high blood pressure, and diabetes mellitus. Some food products also contain the high amount of creatinine such as meat products, fish and seafood. Some drugs are also responsible for high concentration of creatinine, as those drugs decrease the elimination of creatinine through urine. They are Trimethoprim, Sulfamethoxazole, and H2 blocker Cimetidine. Its concentration is measured from urine after 24 of urine collection. Dehydration - person feels dehydrated all the times. The patient feels thirsty all the time because the body wants to eliminate this creatinine level through urine. Fatigue - creatinine is a waste product and its higher concentration disturbs the production of adenosine triphosphate compounds which provides energy to our body. It restricts the formation of energy providing molecule and cause weakness, lethargy or early fatigue. Sometimes its higher concentration may disturb the function of respiratory muscles such as diaphragm which is the main muscle responsible for breathing. A person may not be able to take a breath in due to respiratory muscle fatigue. It may reduce the oxygenation of the blood. Creatinine may decrease the cardiac muscle activity and heart may become weak to pump out the blood to all body parts. It also reduces the blood supply to the brain which may lead to coma or death. Swelling or Edema - high concentration of waste products is associated with various diseases of the kidney. Kidney fails to excrete urine out from the body. There is an accumulation of water in our body plus this water goes into gravity depended extremity and accumulates there leading to peripheral edema. Confusion - creatine also alters the sensation of brain parts and produces confusion like feelings. There are many other symptoms such as nausea, vomiting, headache, etc. Headache - headache occurs due to accumulation of creatinine concentration as it may increase the irritation of nerve endings and produce headache. What Are the Treatments Options to Lower the Creatinine? Low protein diet is recommended to reduce creatinine level. Person should reduce the intake of water or fluid also. Restriction of sodium reduces the pressure of the blood as well as reduces the chances of peripheral edema. Person should be restricted to eat high potassium containing dietary supplements such as tomato, potato, nuts and chocolates. Person should be restricted from eating high concentration of phosphorus food supplements such as dairy products including milk, curd, cheese, shellfish, nuts, pork, soyabean foods,etc. The daily requirement of the protein for an adult is 1 gram per kilogram body weight per day. A child and pediatric age group need more protein as compared to adults because protein is an essential element for bone growth. People should avoid sodium rich foods such as salt, baking soda, cured meat and fish, cheese, pickles, instant soups, roasted and salted seeds and nuts, snacks, fast food such as egg products and ham biscuits, canned vegetables, etc. Restrict the intake of oranges and orange juice, asparagus, nectarines, avocado, kiwi fruit, raisins or other dried fruits, bananas, cooked spinach, potatoes, cantaloupe, honeydew, pumpkin, prunes, etc. 2) Medication - Ketosteril is mainly used for treatment of various disorders of the kidney. Its beneficial effects are thousand times more than low protein diet. It is mainly used for reducing the concentration of creatinine in blood. It supplies the proper amino acids and reduces the formation of creatinine and urea. 3) Dialysis - when diet and medication does not provide any beneficial effects, dialysis is the last option to eliminate high concentration of creatinine. Doctor measures the creatinine level and blood urine nitrogen level to test the efficacy of the kidney function. If they are increased above normal, dialysis is a must to remove it. A health professional collects and saves the urine of patient for one whole day in an air tight container. After that, pathologist may check the concentration of this element in urine and blood. Measurement of creatinine clearance is essential for getting idea about kidney function. Creatinine clearance is measured as difference between blood creatinine and urine creatinine level. If creatinine clearance is below 10 cc per minute, dialysis is must. Procedure - There are mainly two types of dialysis namely peritoneal dialysis and hemodialysis. But for clearance of creatinine, hemodialysis is widely used. 4) Hemodialysis - in this procedure, one connection is made between artery and vein of arm or leg. One catheter is inserted into this connection. Blood coming from artery goes into dialysis machine via plastic tube which is attached to the catheter. Blood is filtered into dialysis machine and waste products are removed from it. This purified blood further enters into circulation. Dialysis works on the behalf of kidney. Dialysis can be done three times in a week. Two catheters are inserted into the connection. One for receiving the blood and other one is for returning the blood into the vein. Do you have a question on Normal Serum Creatinine Level or Kidney Disorders? My creatinine is 3.05 mg/dL. How bad is it? CKD patient with high phosphorus content. Is dialysis required now?